A long time ago, I read the bestselling book by Jim Collins, a book which a lot of you are probably familiar with, Good to Great. I have forgotten everything about the book except his 3 circles framework. 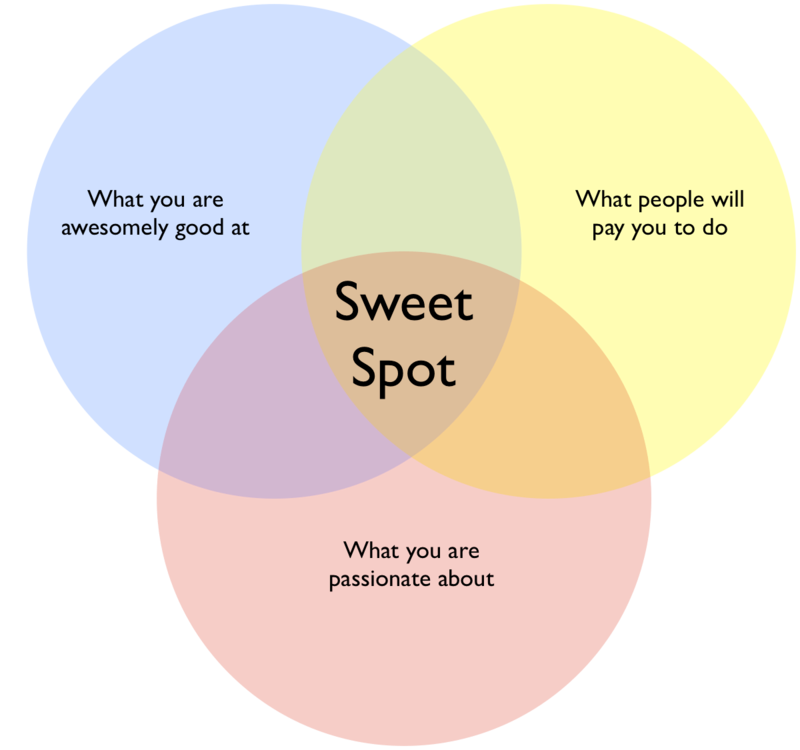 Jim illustrates that for good companies to become great, they have to exist in the “sweet spot” of 3 overlapping circles. While the book was really made for large corporations, and used data mainly from large corporations, I realized how applicable the “3-circle” framework is for startups. I use this framework extensively in startup product development. So let’s say you’re deliberating on what startup idea you’d like to pursue, and you have a few ideas you’re evaluating. This framework then becomes extremely useful. Each of the elements are crucial. 1) You have an idea you are passionate about, and can do it brilliantly, but people probably won’t pay you to do it. Then this is simply a hobby, not a business. I could be the very best in the world in naming every G.I. Joe character who ever existed and recite their complete profiles, but the likelihood of me getting compensated for this skill might not be so hot. Here’s the interesting thing here though: because of the internet, you can now easily find people with similar passions as you have. If you can build a related skill-set to world-class levels – the internet makes it so much easier to find a market. So say you’re the world’s best in restoring action figures, there’s a better chance of finding a market now than there was pre-internet. 2) You can pursue something you are passionate about and people will pay you to do, but you aren’t so good at it. Then at some point your startup will fail, because consumers don’t like settling. This is still a pretty good spot to be in though, because your objective becomes clear – you have to build competence. 3) You can also choose to work on something which you are really good at, and people will pay you for it. If you leave your corporate job and form your startup under these circumstances, then this is really jumping from the fire into the frying pan. This is really the corporate assembly line all over again. It’s actually a bit worse, because it will be harder to extricate yourself from the situation. So while this is tempting, it’s a recipe for frustration and zombification. Don’t. One important thing to consider is that startups are typically composed of more than one founder. So it becomes more interesting (and fun) to tackle these questions. What are we passionate about? What will people pay us to do? What are we collectively awesome at? Time for that coffee meeting. Next PostIf you want to make money, you need to FORGET about the bottom-line. Seriously. Amen! This is great Noreen – definitely something all entreps should take to heart. So many just going after where the money is. Thanks for sharing the link! I agree with some of the points that Peter has raised, particularly with passion being the key foundation. However I must point out that points 2 and 3 require more thought and consideration. Don’t have competence? Then get trained! Lacking opportunities? Then take active steps to be in positions where your skills and passions can valued. This can be difficult and it worth considering a back-up or day job to pay the bills until you hit the core of the all three circles. Great post! I like the “back-up” suggestion until you get the gears right. That was certainly my experience of things!